Before you can make a sale, you need to get in touch with the right person. If you’re in B2B sales, this is sometimes easier said than done. 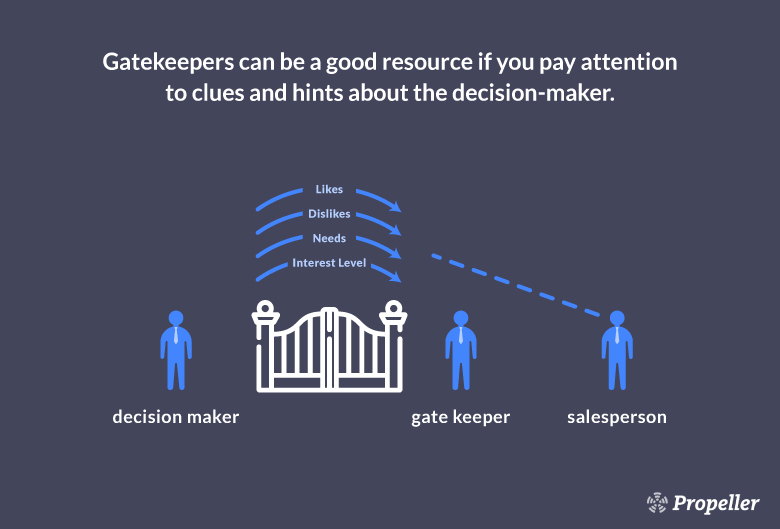 In practical terms, this means if you want to pitch directly to decision-makers (which, of course you do), you need to get through their first line of defense: the gatekeeper. How can you persuade the gatekeepers of the world to patch you through to their bosses? By using proven sales techniques to win them over and open up your next opportunity. Not only will these sales tactics get your foot in the door, but they’ll help you kick it wide open. Any person standing between you and a prospect could be considered a gatekeeper. In most cases, we’re talking about administrative assistants and receptionists who screen calls for their boss. While gatekeepers generally don’t have any purchasing power of their own, they do hold the power of choosing who gets to speak with their boss. 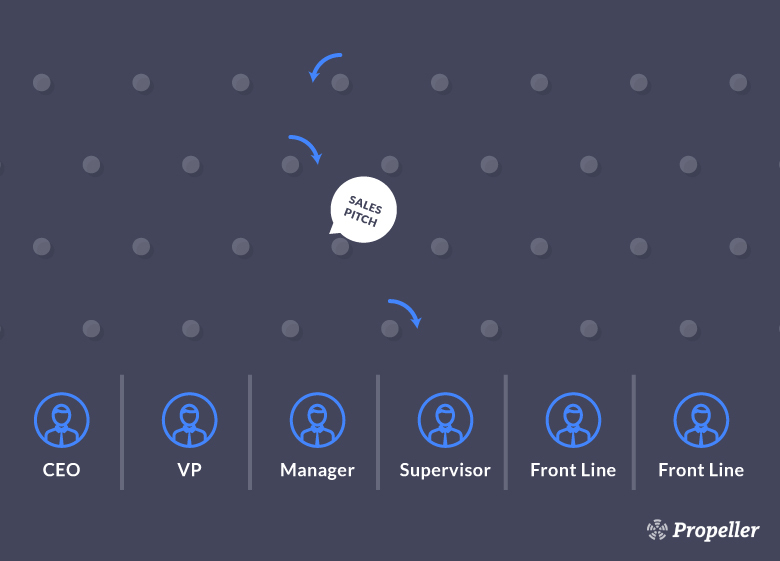 Getting patched through to the decision-maker requires patience, confidence, and a few clever sales tactics – including the 13 we’re discussing today. You can try out these techniques for yourself to get past the gatekeeper, speak to decision-makers, and get to “yes” faster. You can only make a sale if you actually speak to someone with purchasing power. The more authority a person has within the company you’re targeting, the more likely they are to be involved in the buying decision. However, it can be tricky to pinpoint exactly who you should contact if it’s your first interaction with the company. In a case where you aren’t quite sure who you should contact, it’s always better to aim as high as possible. So, on your first attempt to contact a decision-maker, why not aim for the top? That is, when in doubt, start by reaching out to the highest-ranking person whose contact information you can find. Even if you get through to a high-ranking manager, it doesn’t guarantee you’re speaking to the right person – and that’s not necessarily a bad thing. In fact, if your leads have to ‘refer down’ to a lower ranking team member who are more involved in the buying decision, that’s a huge advantage for you. Think about it: the average middle manager isn’t going to be receptive to every sales rep that get through their receptionist. But if their boss refers you to them? Well, then they’ll likely be much more interested in what you have to say. The idea is if you can get in touch with a person higher up the food chain, they might “refer down” to someone more relevant. For example, if you start by reaching out to a VP and she says “Oh, Steve in middle management should handle this decision because it’s more relevant to his department,” then Steve will view the sales rep as someone who his boss is putting him in touch with – which ups your credibility significantly. Obviously, everyone you interact with in a business setting deserves the same level of respect and professionalism. That’s a given. However, with gatekeepers, there’s an even more important reason to be courteous – and a greater risk that you might lose your cool. While it’s normal to get frustrated by their reluctance to transfer you to their boss, you can’t let that frustration come through in your voice. Treat everyone you interact with like they have the power to authorize a sale – including the gatekeepers of the world. 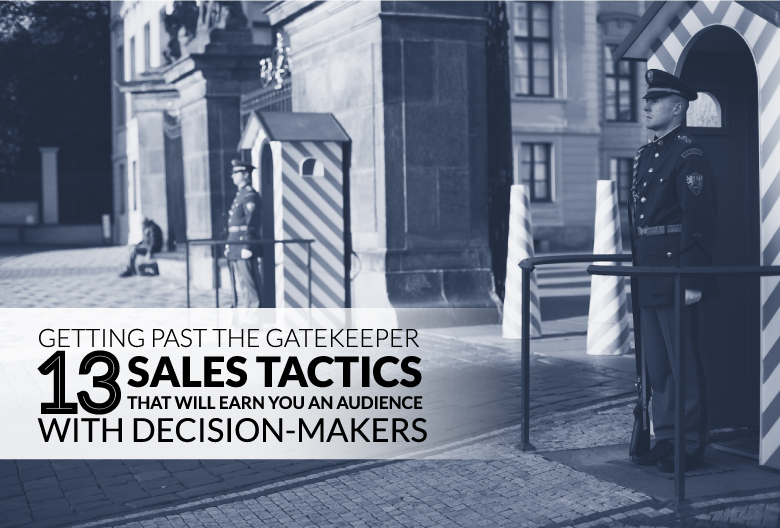 Because in a sense, gatekeepers do have the power to impact your sale: they have the power to decide whether you even get through to the actual buyer. There’s a difference between not being too pushy and being a pushover – and you want to avoid both. Watch your tone and keep the conversation light, but stand your ground and be confident in your request to speak with their boss. Being rude to a gatekeeper is one of the fasted ways to get blacklisted. If you’re overly aggressive or try to bully them into putting you through, you’ll not only blow your chances of speaking to the decision-maker today, but you’ll also ruin your chances of winning over the gatekeeper in the future. Since you know to expect some level of resistance from gatekeepers (again, it’s their job to keep unwanted callers at bay), what can you do about it? Your best bet is to go in prepared. Start by creating a list of common objections and excuses you hear from prospects and gatekeepers about why they can’t take your call right now. Then, write down your best responses for each one. You need to plan these answers out in advance so that you know exactly how to reply in a variety of scenarios – which boosts your confidence and shows the gatekeeper that you know what you’re talking about. While it can be helpful to create a loose call script to help you charm the gatekeeper, you want to avoid sounding overly rehearsed. Plus, you can’t predict exactly how the conversation will play out. So, rather than planning exactly what to say ahead of time, create a list of main points and facts you want to mention. This should include your answers to the objections discussed above, as well as a few key questions you might want to ask the gatekeeper about themselves and their boss. Rather than attempting to dodge their questions or trick them into patching you through to the decision-maker, have a conversation with the gatekeeper. Engage with them and take notes on anything they tell you about themselves, the company, or the decision-maker you’re trying to reach. Even if you can’t get through the gatekeeper on your first try, you can use that initial contact to build rapport so that the next time you call, they’ll remember you – and, hopefully, be more likely to help you out. In an ideal world, you wouldn’t have to deal with gatekeepers at all. But since that’s an unlikely scenario, why not make the best of it? There are many scenarios when the gatekeeper can act as a resource to you. If you spend some time chatting with the gatekeeper, you might learn a thing or two about your target prospect. For instance, if you need to verify who the actual decision-maker is, ask the gatekeeper about who makes buying decisions and who sets budgets to get some insight about the person you need to speak with. Pay attention to any clues or hints the gatekeeper might reveal about the decision-maker. You can also build trust by asking the gatekeeper for advice about what time they think you should call back to speak to their boss. This shows that you value their knowledge and can increase your chances of getting through to a decision-maker. As tempting as it might be to launch into a sales pitch when the gatekeeper inquires about the purpose of your call, save it for the decision-maker. You’re not calling to sell to the receptionist, so don’t waste their time (or yours) explaining what you have to offer. Remember that gatekeepers don’t wield buying power – so you shouldn’t feel pressured to sell them on your product or service. Keep your answers vague so they don’t have a chance to poke holes in your pitch or reject you outright. In order to succeed in sales, you’ve got to develop a tough skin. If you give up after a single attempt to reach your prospect, you’ll never get through to anyone with purchasing power. 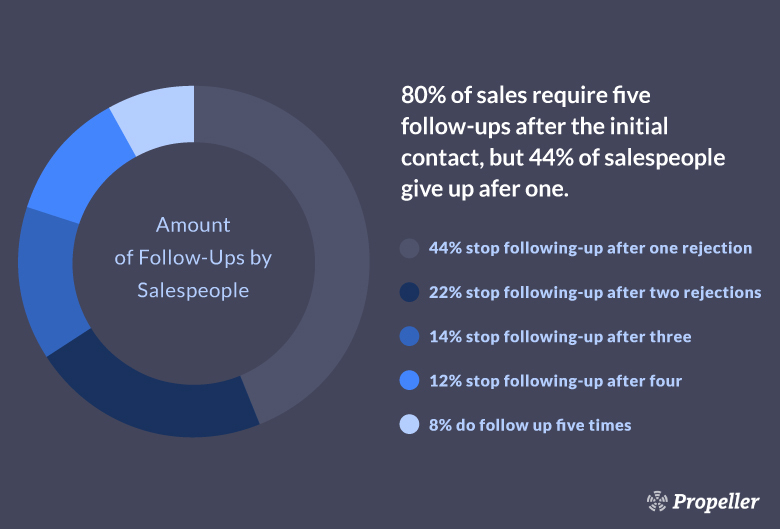 Persistence is key – especially because the average sale takes at least five follow-ups to close. So, don’t be surprised if it takes a few attempts to sell the gatekeeper on letting you speak to their boss. People like to feel important and they like to be remembered. If you call and speak to the same gatekeeper multiple times, make an effort to get to know them, pay attention to what they tell you, and write down any details they mention about themselves or their role in the company. Even better, record this information in your CRM so you never lose track of it. If you do something nice for someone, they’ll often feel obligated to return the favor. So, whatever details you learn about the gatekeeper as a person, use this knowledge to leverage the law of reciprocity. For instance, if know the gatekeeper’s name and title, you can send them a little handwritten thank you note for taking the time to speak with you. This increases the likelihood that they’ll eventually let you speak their boss and – if you build a strong enough relationship – you might even get the gatekeeper to vouch for you. This isn’t so much about sneaking past the gatekeeper as it is about getting creative in your approach. For example, you can use your knowledge of the gatekeeper’s schedule and duties to call at a time when they’re unlikely to be in the office – thereby circumventing them altogether. If you call during standard business hours, you’re unlikely to bypass gatekeepers. However, if you call before 9:00 or after 6:00, your chances of reaching a decision-maker is actually higher. Why? Because gatekeepers are typically employees with set schedules during office hours. Your prospect, on the other hand, is likely to come in early and stay late to handle their bottom-line responsibilities.